FuelCell Energy has won a $3 million federal grant to advance the commercialization of its long duration energy storage, a technology that is a good companion to renewable energy. “Fuel Cell Microgrids: The Path to Lower Cost, Higher Reliability, Cleaner Energy,” downloadable at no cost, courtesy of FuelCell Energy. Awarded by the Advanced Research Projects Agency-Energy (ARPA-E), the funds will allow the Connecticut-based company to further developer its advanced solid oxide cell technology. The process allows for alternation between electrolysis and fuel cell power mode (known as reversible SOFC, or RSOFC) in an energy storage application. RSOFC systems can produce hydrogen or other carbon-neutral fuels in electrolysis mode and later convert the stored fuel to power in electrolysis mode. “FuelCell Energy is commercializing reversible solid oxide systems for energy storage, and this project will further advance the initiative including the evaluation of our reversible fuel cell’s ability to produce and use hydrogen and other fuels,” said Tony Leo, vice president of advanced applications & technology development for FuelCell Energy. Long duration energy storage is increasingly viewed as an effective way to balance out the intermittency of renewable power. The stored energy is released when renewable generators suddenly fail to produce power, generally because the sun isn’t shining or wind isn’t blowing. FuelCell Energy’s process increases the duration of energy discharge by adding more fuel storage, without increasing the number of fuel cells. This makes long duration energy storage more affordable, according to the company. “Critical to any storage solution is affordability, which is why the high round trip efficiency of this reversible fuel cell and the utilization of a cost-effective energy storage medium for long durations is so compelling,” Leo said. Fuel cells use chemistry to convert a fuel source into electricity and heat in a highly efficient process. Since no fuel is burned, the process emits virtually no pollutants. FuelCell Energy won the funds under the Renewable Energy to Fuels through Utilization of Energy-Dense Liquids (REFUEL), a program of ARPA-E, a division of the U.S. Department of Energy. Read more about fuel cells and their use in microgrids. 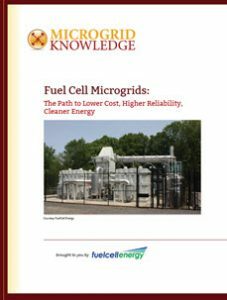 See “Fuel Cell Microgrids: The Path to Lower Cost, Higher Reliability, Cleaner Energy,” downloadable at no cost, courtesy of FuelCell Energy.